On kaunis metsäinen perusteilla ei ole unohdettu, erittäin tilava ja valoisa talo on 250 neliötä, josta on näkymät järvelle. Iso oleskelutila, jossa takka, avokeittiö, 4 isoa huonetta, jossa runsaasti säilytystilaa, 3 kylpyhuonetta (lakanat, pussilakanat ja pyyhkeet), kolme wc, kaksi terassia kaunis ja rauhallinen paikka lähellä kaiken. Ihanteellinen urheilun ystäville luonnon ja kulttuurin. La maison est magnifique, spacieuse, propre, bien décorée, bien agencée. Il y a 3 salles de bain pour accueillir tous les enfants quand on rentre du ski. Le salon est très grand, le soir avec la cheminée, c’est très agréable. La localisation est parfaite : face au Lac Beauport, on peut aller se promener sur le lac et faire du patin. A 5 min de la pourvoirie pour les activités comme Chien de traîneaux ou motoneige. A 5 min de la station de ski du Relais. On peut aller faire du ski juste pour la matinée ou la soirée. The house is absolutely amazing! Great view , immaculately kept and very well equipped.Its fabulous! We were lucky enough to spent 12 nights at this amazing house. The location is fantastic being only 20 minutes to Quebec City.It’s also within easy acces to activities such as skiing, snowboarding, snowmobiles, ice skating and dog sledging! The house is very well equipped and Lucie and Yves were incredibly helpful. The view of the lake from the house is stunning- particularly when covered in snow. We would recommend this wonderful home to anyone and we hope to return soon. An unbelievably relaxing holiday ! This was a wonderful house for girls' trip to Quebec. We loved the open floor concept and well equipped kitchen. Not far from Quebec City and other places we wished to visit. We were two families of 8 (4 kids) and had the best time at the house. The location was perfect and the view of the lake from the home, unbeatable. 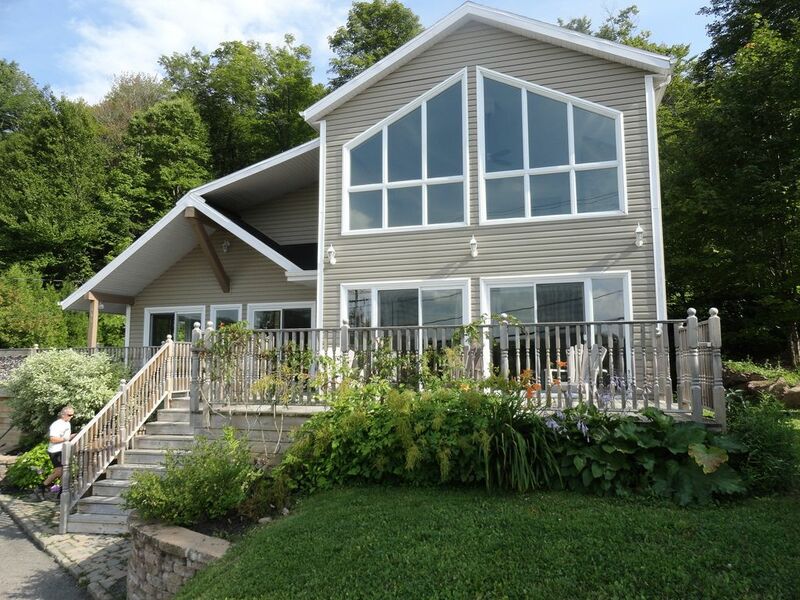 The house was spotless, more than well equipped for a group of 8 to relax, explore and enjoy the neighborhood, make trips to Quebec city and other attractions in the area. We made day trips to Canyon St Anne, Ile d'Orleans, and few trips to Quebec City. With a few rainy days, we relaxed at home, enjoyed the grill and wine. We loved Quebec city and would return to the area and the home anytime. A comfortable and well outfitted vacation spot. Had all the attributes represented in website. Good response from Lucie, the manager and caretaker. She really wants people to have a good experience in QC and the rental house. She responded quickly to deal with a couple issues that came up during our week. The furnishings in the house are good quality and the kitchen well stocked with everything you need, including dishes, glassware, pots and pans, but also a well functioning gas grill. Internet was high quality. Everyone in our group of 10 was quite impressed with the place. The nearby lake had looked like a potential plus, but was basically controlled by private owners around it to limit it being a resource for guests. All in all, we highly recommend. the house and owners are great. If you are looking for a house that is your base to explore the region or use as your base for skiing I highly recommend it. However I was looking for a quiet place next to a lake to spend a lot of time at. I did not realize it was right next to a busy road and the lake is really not accessible from the house. A lot of houses on the road are for sale. I think it just got really busy and people want to move away from this. Nothing the owners can help, but I wouldn't have rented the place if I realized that this is really not a great vacationing home but a great base to sleep and eat. I wish other reviews would have been a bit clearer about it. Keskusta Quebec City ja 20 minuuttia. Montmorencyn Falls ja Île d'Orléans lähellä. Maastohiihto, koiravaljakkoajelua, moottorikelkkailua ja lumikenkäilyä polkuja lähellä. Sokeri hökkeli muutaman kilometrin keväällä.